One of the methods my grandmother (known as Granny B) and my mother after her, used to make ends meet was a simple recipe. It is called Garbage Stew, since it is made from ingredients most people throw out. After almost every meal, there is a little left over. A spoon of corn, a couple spoons of green beans, or even just the juice the vegetable cooked in. One of the methods my grandmother, and my mother after her, used to make ends meet was a simple recipe that used this little bits of leftovers. 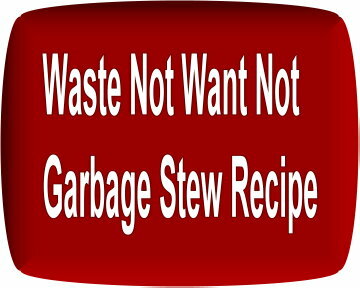 It is called Garbage Stew, since it is made from ingredients most people throw out. Granny B carefully collected all the left over foods into a large freezer container and set it into the freezer. After each meal, she would add whatever leftovers there were (boneless meat, gravy, beans, vegetables, macaroni and cheese, broth, casserole leftovers, everything except bread) to the frozen remnants of previous meals. When the freezer container was full, she would thaw it out. After browning a half pound of hamburger, she would put the hamburger and the leftovers into a large soup pot and cook for an hour or so, until all the flavors mingled. This is a hearty, satisfying soup that doesn't break the bank. Most of the contents of the soup are leftover items you might otherwise have put down the garbage disposal, hence the name 'Garbage Soup.' It is a makeover of your leftovers. If you don't have enough vegetables, you can always add a can of Veg-All or a couple of diced potatoes. Or any other canned or fresh vegetable you have on hand. Add all ingredients to a large soup pan. Simmer soup for an hour. Taste to determine whether to salt and pepper soup. It is important to taste it first, since most of the foods in the frozen soup starter will have been seasoned the first time they were served. Serve the stew with cornbread or crackers. 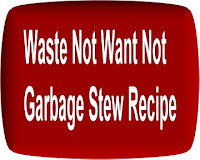 Garbage Stew is similar to the Hobo Stew recipe that we used for cookouts when I was a teenager. The sponsor of the cookout brought one or two pounds of hamburger. Everyone else in the crowd brought one can of something to add to the pot. After the meat was cooked and all the cans added, it was all heated up together--it always tasted great, regardless what went into it. Have you ever eaten Garbage Stew or Hobo Stew?